The Avg. Group Saves 21.6%! TD Banknorth Garden, Faneuil Hall Market place, historic North End, the Museum of Science and the New England Aquarium. Minutes away from Cambridge & Charlestown..............SUBWAY: Steps away from Red, Orange & Green line. "Exciting boutique hotel in a great location"
There is a new option in Boston. 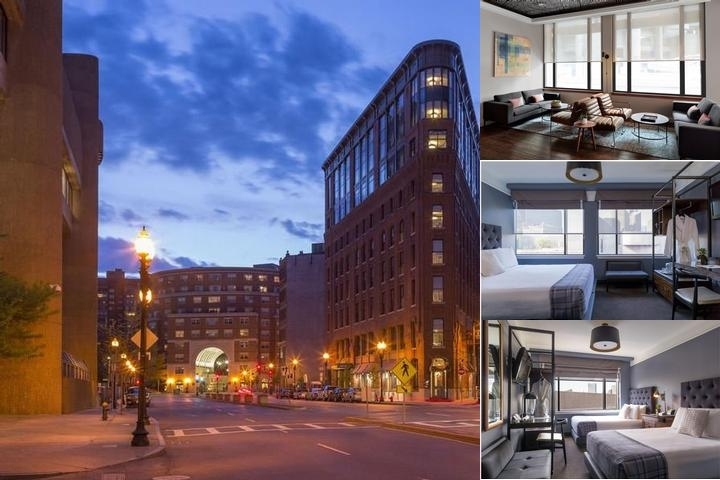 The new Boxer Hotel is an exciting boutique hotel in a great location just a few blocks from Faneuil Hall, the TD Garden and the Boston Courthouse. Modern rooms and a great new restaurant offering a simple menu at great prices are some of the things to enjoy at the Boxer. This new option will save you money, but allow you to be in a great area of Boston. The hotel was perfect for our itinerary. 31-Mar-2019 Verified Review, stayed from Wed Mar 27 to Thu Mar 28 2019 at a $206.00 group rate. Located downtown in the historic Bulfinch Triangle, the Bulfinch Hotel is a contemporary urban oasis in a re-invented 19th Century beaux-arts style building. Just steps away from Boston's major attractions, government offices, businesses, universities, shopping, dining and events. Our 79 modern guest rooms and junior suites are a tranquil escape and compliment our style of personalized service. ****************************************************All of our custom designed guest rooms feature private marble bathrooms with a walk-in shower or tub, walnut furnishings, coffee maker, iron and ironing board, hairdryer, work area, wireless speakerphone with private voice mail and complimentary high speed internet access. ********************************************** CLASSIC DOUBLE: A perfect choice when traveling alone, offers one double bed. ********************************************** DELUXE DOUBLE/DOUBLE: Larger than the Classic Double, the Deluxe Double offers two Double Beds. **********************************************DELUXE KING: Larger than the Classic Double, the Deluxe King offers one King bed. **********************************************JUNIOR SUITE: Our premium room, located at the nose of the building, offers a unique perspective with our signature triangular shape, a King Bed and separate sitting area, including a full sleeper sofa bed. We are part of clean the world and Earthview. Hotel Features – With a blend of historic charm, excellent and attentive service, and up-to-date luxuries, the Bulfinch Hotel Boston is situated in the heart of historic Boston. This boutique hotel is named for Charles Bulfinch, the man who designed this outstanding flatiron building and who also gave his name to the neighborhood, Bulfinch Triangle. Guest Rooms – The Bulfinch Hotel Boston’s 71 guest rooms, including eight suites, boast excellent amenities that offer a serene retreat for business and leisure travelers. The Serta Perfect Sleeper mattresses dressed in white damask linens are pure comfort, tempting guests to take advantage of room service, as well as the coffee and tea in each room. The modern decor is accompanied by up-to-date amenities such as the 27-inch flat-panel television and complimentary high-speed Internet access, making it easy to work in the comfortable work area. There is also a wireless speakerphone that includes private voicemail. A complimentary morning paper is provided daily. Nearby Attractions – In the heart of downtown Boston, the Bulfinch Hotel, housed in a completely restored flatiron building, is within walking distance of many historic and cultural attractions, including the famous North End of Boston, Government Center, TD Banknorth Garden (home of the Boston Celtics and the Boston Bruins), Faneuil Hall, The New England Aquarium, the Boston Common, and much more. The Bulfinch Hotel Boston is ideally located for convenient access to business, shopping, dining, and entertainment centers, and the many universities and educational institutions of Boston. Perks & Amenities – The Bulfinch Hotel Boston offers a 24-hour fitness center. In addition to the many in-room amenities, the hotel boasts complimentary coffee and tea service in the lobby, laundry and dry cleaning service, and luggage storage. In addition, the Flat Iron Tapas Bar & Lounge serves excellent world cuisine. Full American Buffet breakfast valued at $17. Includes fresh eggs, bacon or sausage, fresh breads, breakfast potatoes, pancakes or french toast, greek yogurt, house made granola, house made pastries, juice, coffee, tea. 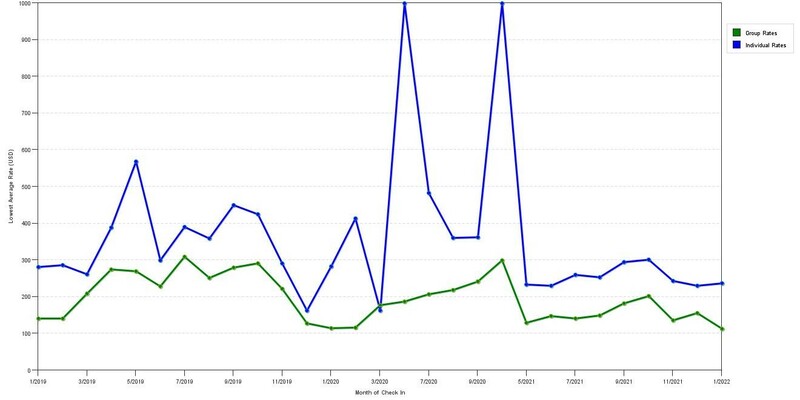 The chart above shows fluctuations of prices for both our group rates and the best individual traveler prices our system could find at the time the group bid was placed. The best group/meeting rate displayed is 89.1% in the month of January 2020 and the highest average individual rate is $999 in the month of September 2019. This chart will show past seasonality and also project future months. If you are flexible with dates, you may want to consider staying at The Boxer Hotel in a month when rates are lower. Below are the meeting, banquet, conference and event spaces at The Boxer Hotel. Feel free to use the The Boxer Hotel meeting space capacities chart below to help in your event planning. Hotel Planner specializes in Boston event planning for sleeping rooms and meeting space for corporate events, weddings, parties, conventions, negotiated rates and trade shows. 22 x 9 x 9 Ft.